The Falcons are still struggling to play a full sixty minute game. But a great third period helped Bowling Green take game one from the Nanooks. Tommy Burke started in net for the Falcons and made 26 saves in the winning effortt. Sean Cahill countered for Alaska and stopped 30 of 33 attempts. The Falcons struck first at 9:05 of the first period. Mitch McLain passed the puck through the crease where it was deflected by Cahill. The deflection found Cooper’s stick who picked up his first marker of the season. The Nanooks tied the game at 12:47 of the first period. The Falcons turned over the puck in their zone while on the penalty kill. Brandon Morley took the puck from the corner and fed Peter Krieger who one-timed a goal right at the crease. Brandon Hawkins gave the Falcons their second goal of the game at 8:52 of the first period. Brett D’Andrea fed Jacob Reichert who found Hawkins from behind the net. Cahill got a piece of the shot but it still found twine. The Falcons challenged Cahill 13 times in the first frame while the Nanooks had 10 shots. Marcus Basara tied the game back up at 4:12 of the second period. Colton Parayko passed to Basara who went low on Burke who had gone to his stomach to cut down the posts. Alaska took the shots lead after the second period as they challenged Burke twelve times. Bowling Green fired seven shots on Cahill. 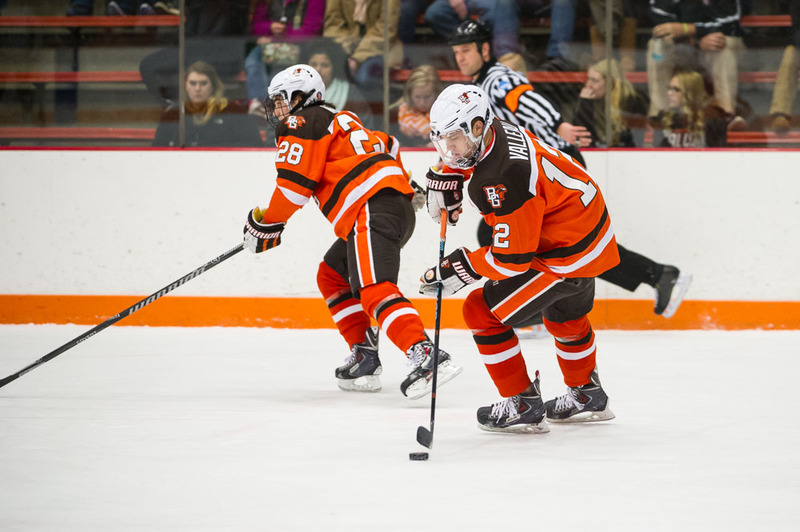 Bowling Green re-took the lead at 12:56 of the third period. Mike Sullivan angled a pass off of the far boards where it found Pierre-Luc Mercier’s stick. Mercier dished a perfect pass to Matt Pohlkamp who one-timed a laser past Cahill. Pohlkamp’s marker would set up as the game winner and the Falcons took the 3-2 win. Burke stopped all 6 shots he faced while Cahill stopped 12 of 13. Bowling Green moves to 6-2-1, 4-1-0 on the season while Alaska falls to 5-4-0, 0-3-0. The team’s will conclude their series Saturday at 11:07pm EST.